And even though I have a Ph.D., I also like to think I have a decent level of common sense. But I am constantly humbled by foreign bathrooms. My most recent challenge occurred this morning in Bratislava, when I took a shower. 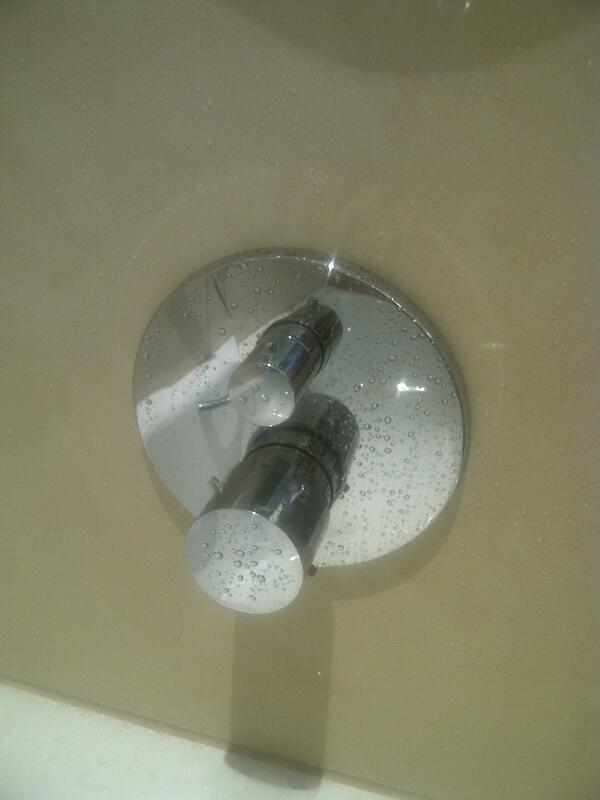 Here’s a picture of the shower controls. Maybe it’s obvious to you how they work, but it took me a couple of minutes of random turning and twisting before I got the shower running at an appropriate temperature. That was just the beginning of my adventure. I then realized, when my shower was finished, that I didn’t know how to turn everything off. So I spent another couple of minutes randomly fiddling with the two knobs (alternatively pelting myself with freezing or scalding water) before it stopped running. I had a similar episode last week in Zürich. I was in my room and had to use the bathroom to recycle some diet soda. As I was standing there, doing my business, I noticed that the toilet had a couple of strange devices inside the bowl. I then noticed that the inside of the toilet lid had a couple of pictures showing how the devices would wash and then dry one’s nether regions. I didn’t think to snap a picture, but I perused the Internet and it was something like this, but had a drying nozzle as well. It occurred to me, after I was done, that it might be dangerous to flush because water might come shooting up at me. And even if I stood to the side while flushing, I didn’t want to risk getting water all over the bathroom. There were no written instructions, not even in German. So, after pondering the matter for a while, I realized that the safest option would be to sit down and then flush. So with a mixture of trepidation and anticipation, I did just that. You can imagine the anti-climatic feeling I got when nothing happened. No whirring, no buzzing, no jets of water, no dryer. The toilet flushed, and that was it. But that wasn’t the end of the matter. I’m one of those people who has to touch when I see a “Wet Paint” sign, so I was curious to experience this high-tech device. So I spent several minutes trying to figure out how the damn thing operated. European toilets often have two flush controls, one being for light jobs and the other for heavy jobs (I’m trying to be delicate). But it didn’t matter which one I flushed. I thought that perhaps the controls only worked if some sort of sensor could tell you were sitting down (and using the heavy-duty flush control at the same time). But that didn’t work. But I still have stops in Vienna and Kiev before returning to the United States, so perhaps I’ll get another opportunity to demonstrate by bathroom naiveté. P.S. If you’re missing the public policy commentary you normally find on my blog, one of my goals in Slovakia is to convince the new socialist government not get to rid of the flat tax. Sadly, I think it’s a lost cause, just like in the Czech Republic (where taxpayers are getting betrayed by a supposedly right-of-center government). Well my friends told me a story of this Canadian lady they knew who used a unisex restroom with a urinal. No joke: she thought the urinal was the sink and was raving to everyone afterwards about “this cool invention”! Thankfully I had swallowed my diet coke before reading this. I laughed so hard I alarmed my children. Punchline = “You poor fool, you pushed the automatic tampon remover.” I must have been 12 when I heard that joke the first time. Keep fighting the good fight, World Traveler! “LOL” is supposed to mean “laugh out loud” or “laugh on line” depending on who you listen to. I was online while I laughed out loud. Great post Dan! In Japan, the toilet adds water when you sit down. It assumes a big job. I always fear the filling won`t stop and since instructions are in Japanese well I to would be embarrassed to call the front desk. I had the same experience last month. In St Louis, Missouri. Strange..looks like a combo toilet and bidet!